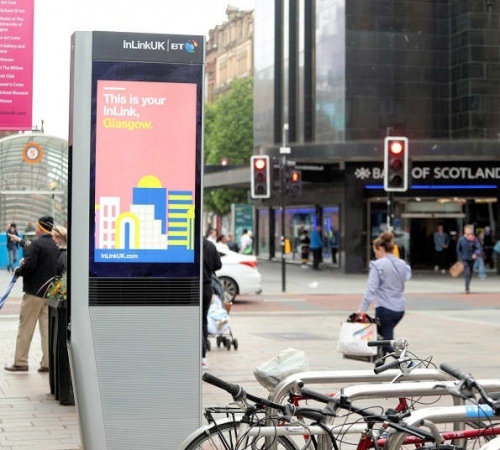 After deploying in London and Leeds, BT has today announced the first roll-out of 12 InLinkUK smart kiosks in Glasgow (Scotland), which claim to offer “ultrafast” 1Gbps capable free public WiFi, free UK phone calls, USB device charging and a range of other digital services to help people in the vicinity. The first kiosk went live on Buchanan Street and others will soon follow around the city centre. Overall a total of 150 kiosks have now been rolled out to parts of London, Leeds and Glasgow. The InLinkUK kiosks reflect a partnership between BT, Intersection (LinkNYC) and advertising company Primesight. The plan is that they will eventually replace over 1,000 pay phones in major cities across the UK. Funding for the kiosks is extracted via revenues from advertising on the large 55″ HD digital displays. Unfortunately BT has not provided any evidence to substantiate their claim of offering the “fastest free public wi-fi in the UK” (difficult to prove). Some speed testing conducted last year (here) unsurprisingly revealed that real-world performance actually came in well below the headline claims of ‘up to’ 1Gbps (sub-100Mbps is a more viable expectation). Wireless broadband signals and network congestion are of course notoriously difficult things to tackle in a real-world environment but this shouldn’t overshadow the fact that BT’s kiosks still offer a useful set of features. The real speeds may struggle to hit a Gigabit but they’re still impressively fast for a free public WiFi hotspot. We understand that planning consent for more kiosks has already been approved by local councils in Birmingham, Newcastle, Southampton, Gateshead and Sheffield, as well as the London borough of Kensington & Chelsea. If BT cared about providing good broadband they would do something about EO Lines etc. This just accentuates the difference between areas with good broadband and the rest of us (rural or urban). The nearest working phone box to me is over 4 miles away – the nearer ones have been decommissioned. In fairness, nobody really makes “loads of money” from the sort of advertising that those kiosks deliver. Whether or not BT deploys these new units will have no bearing on Openreach determining the attractiveness or otherwise of upgrading the broadband infrastructure serving your home. I would imagine the the return on investment for companies advertising on those screens is between sod all and not very much! This is more about brand placement. Currently if you do not use the access for 30 minutes or make continuous use for 24 hours you will be cut off but can log back in. 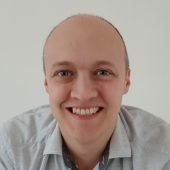 With Passport your connection is a little more secure. These will be isolated installs but will provide a known location for connectivity if you need it and I am sure enterprising residents within range can use them as a cheap broadband equivalent. If abused the commercial their model will change. While these boxes look good in London’s high streets, in parts it is very noticeable that those who make best use of them are the drug users. How kind of BT to let them order their drugs from their dealers free of charge. Surely the same could be said of any “free” WiFi service on trains, buses or underground? Hopefully though the problem you have highlighted will therefore already be being addressed. What’s wrong with BT helping in the fight against prohibition?